By using less sugar, you allow the flavor of the fruit to SHINE! I love making low-sugar jam because it allows the flavors of the fruit to shine without hiding behind gobs of refined sugar. This particular recipe is a bit decadent because it uses a real vanilla bean to add a touch of “cream” flavor to each jar. (There is no actual cream in the recipe.) You can certainly make it without the vanilla and you will still have a superior product because the sweetness of the strawberries is the main attraction. This recipe calls for “Ball No Sugar Pectin” which is a commercial, low-sugar pectin. It can be found wherever canning supplies are sold. If you can’t find that particular brand, please follow the strawberry jam instructions inside the package of whichever brand of “low-sugar pectin” you can find. Add the vanilla bean seeds as I do here and the recipe should work beautifully for you. Each pectin manufacturer can have slightly different measurements or technique for making the jam firm up, so be sure to follow your brand’s recommendations exactly so you have a successful gel. How Does Low-Sugar Pectin Work? Many people ask me if the low-sugar pectin is actually an artificial sweetener. NO! It is just pectin with the addition of calcium. The sugars of the fruit combined with the acid in the recipe (usually lemon juice) and the pectin/calcium combo in the box are what create the “gel” or set. That is why it is so important that you not adjust the recipe other than seasonings. The exact ratios must be met for it to work. Cool, right? 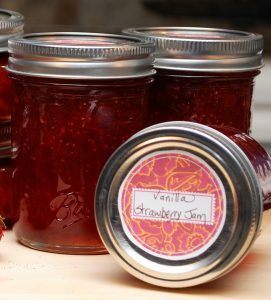 The finished jam explodes with flavor from the berries and the vanilla! Fill your water bath canner with enough water to cover the jars by at least one inch. Click to learn more about water bath canning. Wash all jars and lids in hot soapy water. Rinse and check tops of jars for chips. Discard any chipped or cracked jars. You do not need to sterilize these jars because you will be water bath canning them for 10 minutes, which sterilizes the jars during the processing. Just place the jars in the water bath canner while you bring it up to temperature and the jars will be hot when you are ready to add the hot jam. Wash and hull the strawberries. Slice them in half and gently crush them until you have 4 cups of crushed strawberries. Save the remaining strawberries for another use (such as ice cream or waffle topping). In a large, 6-8 quart heavy-bottomed pot, over a medium flame, combine the strawberries, apple juice and pectin. Use a sharp knife to cut down the center of the vanilla bean, open it and gently scrape out the black seeds from the entire bean. Add all of the seeds to the strawberry/apple juice mixture and stir well. Add the entire vanilla bean pod into to the mixture as well. To reduce foaming, you can add the butter or margarine to the pot if you wish. Raise heat and bring the mixture to a full rolling boil that cannot be stirred down. Stir constantly to prevent burning. Once you have the full boil, add the sugar and return to a full rolling boil. Then, boil for three minutes, stirring constantly to prevent burning. 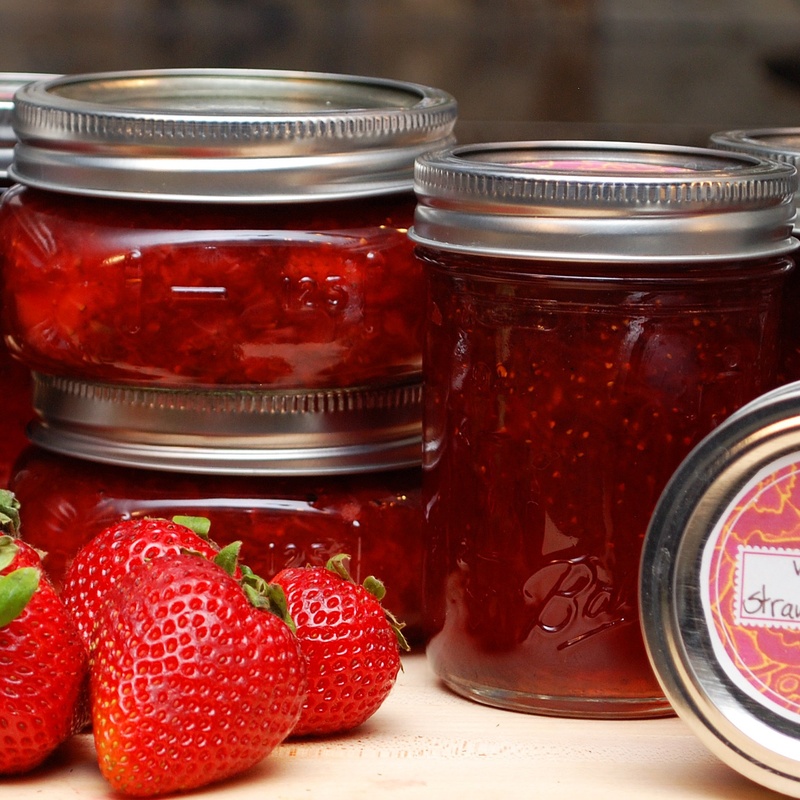 Fill your hot jars with jam, leaving a ¼ inch headspace. Use a clean damp paper towel to wipe the tops of the jars. Add a hot lid to each jar and apply the metal ring (or band). Only tighten the band to “finger tight” – Do not crank it down too tightly. Place the jars in the canner being sure that water covers the tops of the jars by at least 1-2 inches. Bring the water in the canner to a steady boil. Begin timing and process the jars for 10 minutes. If you are over 1,000 feet, you need to adjust your time for altitude according to the altitude chart found on our water bath 101. Remove jars from canner and set upright on a towel to cool undisturbed for 12-24 hours. After cooling, check seals by pressing in the center of the lid. If a lid does NOT flex up and down, it is sealed. Store sealed jars on the pantry shelf for up to one year. Any unsealed jars (with flexing lids) need to be stored in the refrigerator and eaten within a few weeks. I made two batches of the Strawberries & Cream Jam yesterday. It was quick and easy and has an absolutely AWESOME flavor. I could just eat it out of the jar with a spoon it tastes so good! Thanks for sharing such a wonderful recipe. Fantastic Starla! I am so glad you wrote to tell me. Enjoy! Fantastic Carmen! I’m so glad you like it. It is one of my favorites too. Oh I’m sorry I thought it was a gel/liquid that you used. I have the no/low sugar one you have also. It’s just in a large jar. So 1.75oz pkg is equal to 3 Tbsps of the jar correct? I’m not sure Carmen. Mine came in a box and I add the whole box. If yours comes in a larger jar, it should hopefully tell you on the jar. I don’t have that on my pantry to check. Sorry! The no sugar pectin you used is it the gel or powder? The only 1.75 oz I found was gel. Would it be ok to use the powder low no sugar? I used a powder. I don’t know of a no/low sugar pectin that is a liquid. But if you found one, make sure it says “Low or No Sugar Pectin” on the package. Otherwise, this recipe won’t work. If you use a different brand than I did above, just following the basic order of operations in the instructions inside the box. Each brand is slightly different and sometimes they have you do the steps a little differently or they have you add the pectin at a different time. Once you find a brand you like, stick with it. That way you always know the order and method. It becomes routine. Good luck! I’m sure it will be yummy. I just printed out your low sugar strawberry recipe and 17 pages were printed when I should have only one. how can I just print the recipe and your directions? Oh no! I am so sorry Ada. We are going to look into this right now. It is NOT supposed to do that. Please give us some time to see if we can fix it. I will post here again when we have it all fixed. We are trying to figure out what went wrong. When we push the “print” button at the bottom of the recipe, it only prints 3 pages and we have tried this in different browsers. Did you print a different way? If so, how? Also, what was printed? Comments or something else? Thanks for letting us know. We want to fix this problem so that it doesn’t happen to anyone else. I tried to email you, but your email bounced back, so I figured this was the best way to contact you. I followed the directions, but now 2 months later, the jam that is still sealed in the jars in the pantry has turned sort of gray color – when I opened one, it still smelled OK – Is this OK to eat – is the color change because there are no preservatives in it? or not enough acid perhaps? The color change is due to the low sugar. (Sugar helps retain color.) The jam should be fine to eat as long as it was sealed and you had followed all the other instructions. Having a darker color is normal. The flavor should be the same and it should be fine to eat. If you ever notice an unsealed jar or if a jar is oozing, then you should not eat the contents. But if the seal is intact and normal, its good – just darkened. Can you substitute blackberries and vanilla extract in this recipe? Or perhaps do blackberry jelly instead of jam? I get organic extract which is so much nicer than regular. Yes, you can make something similar with other berries but for that you would need to follow the recommendations of your particular pectin box. The measurements might be different for the berries. And every box has a jelly recipe as well. I am just unsure of the measurements of berries. As for the vanilla, yes – you can add that to any of the recipes and it should be fine at the same measurement. I would like to try making jam with the least amount of sugar or artificial sweetener possible. Since I am using no-sugar-added pectin, is it possible to omit the sugar completely or sweeten to taste with a very small amount (i.e. 1/2 cup)? And is this possible to do with most low-sugar jam recipes? That is correct Elizabeth. A low/no sugar pectin allows you to use NO sugar if you wish. You just let the fruit be the sweetness. I have not used organic sugar for canning, but I absolutely should! It should work exactly the same. I agree – organic is best! I’m happy to help. Any time! You did fine! Processing for 10 minutes takes care of the seal and the bacteria. The purpose of heating the lids before hand is mostly to soften the rubber gasket so that it makes a proper seal. Just be sure to check each jar when you go to open it – making sure it still is sealed. No worries about the strawberries floating. The two layers you see are jelly at the bottom and the fruit at the top. It happens sometimes. Since you followed the instructions perfectly, I would suspect that either the fruit was underripe or it was not crushed enough (both can cause fruit to float). All it means is that the fruit had too much air in it and floated to the top. When you open each jar, just give it a stir and it will be fine. I’m so glad you enjoyed the show and my garden. Keep up the canning! You will love it when you open those jars in the fall and winter! http://www.LivingHomegrown.com and sign up for my newsletter. I definitely think you should get some chickens! Saw the show today and loved it! I’ve been wanting to can for years and this was the first time I felt as if I could really do it. Thanks for the great explanation!! So my husband and I did the strawberries and all went well – the lids popped and we’re just letting them hang out on the counter – but why is it starting to separate in the jars – I can see 2 distinct layers now – a clear (red) layer on the bottom and then the fruit heavy on top. I’m pretty sure we followed things to the letter – we didn’t add the butter. Thanks a million – Loved seeing your garden too – what a wonderful thing you are doing there! 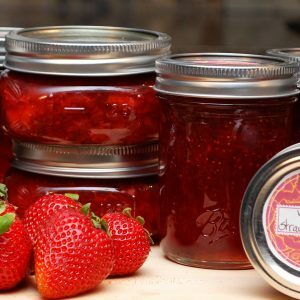 I love this strawberry jam…can you use the same recipe and substitute blueberries for the strawberries? I don’t think you can straight sub blueberries for the strawberries because they probably have different acid levels and since this is a low sugar recipe, the ratios have to be exact to get a good gel. HOWEVER, if you buy a low or no sugar pectin, there are recipes inside the box and blueberry is very common. I’m sure you can make it with blueberries, but the measurements will be just a little bit different. I’m a diabetic. Can Splenda be used instead of sugar ? YES! You can use Splenda with this recipe. It only works if you use the “Low or No sugar Pectin” described above. Normally the sugar helps the mixture gel in a jam recipe. But if you use the special pectin, it will gel even if no sugar is added. So feel free to use Splenda in the recipe above. How much is a personal choice and would also be based on the sweetness of the strawberries. You may have to taste to decide the best amount to add for you. You are correct. Oil is not safe to use in water bathed foods. There is actually no ‘cream’ in this recipe. Vanilla is used to give the flavor of “strawberries and cream”. No oil is used. So it is still safe to water bath. Yes, there’s no cream, but there is butter. That’s why I asked about oil. Does butter not count as an oil in this context? Ahhh – I’m sorry Donna. I misunderstood what you were asking. This is an excellent question! Dairy products, or oils are dangerous to add to canning foods with a pH above 4.6. (Vegetables, meat, home canned soups, etc) because the fat can encapsulate or insulate any botulism spores from heat. In other words, if you add cream or milk to a food and can it, you cannot ensure that you heated any botulism spores high enough to kill it and you may get botulism – even if you pressure can it. And botulism grows in pH levels above 4.6. HOWEVER: THIS RECIPE IS FOR A HIGH ACID FOOD with a pH below 4.6. Botulism spores cannot grow in high acid. That is why we are able to “water bath can” foods such as fruit, jam, jelly, pickles and tomatoes that have been acidified. So even if the oil encapsulates any spores, they cannot grow in a high acid food. The important thing about that is that you don’t change the pH into the danger zone by adding the “oil”. In this recipe, the amount added is insignificant. It is 0.004 of the total volume of ingredients. (Which is a tiny percentage) Not enough to change the pH level into the danger zone or cause spoilage. So here are the important things to remember: Deciding if something is okay to be water bathed (vs. pressure canned) depends mostly the pH level of what you want to can. It is usually safe to water bath items with a pH below 4.6 (fruit, jam, jelly, pickles and tomatoes that have been acidified). Things with a pH above 4.6 must be pressure canned (vegetables, meat). 3) The natural sugar in the fruit is acting as a preservative. Thank you so much for this very comprehensive answer! I can’t wait to try this recipe when my strawberries come in. No problem – Glad to help! Oh yes Shardae! I definitely think you should start! And this is a great recipe to try. Just to let you and anyone else know, you can use a product called Pamona Pectin which is a calcium based pectin for all no-sugar, low sugar, stevia, and regular sugar canning. I bought mine at a local co-op and it ran about $4.50 for the box. You mix up the calcium water and can keep that in the fridge for months! Then just add however much of the pectin packet that is needed and you have great jam! I made some Apricot Jam with this and just a 1/4 teaspoon of stevia and it is wonderfully sweet and set perfectly! I will be trying the above recipe this week. The vanilla bean sounds so very good! I just bought myself some Pamona Pectin but had not tried it yet. (I found it at Whole Foods) I am so glad to hear first hand that it works well. I can’t wait to try it myself now. I think I will try it with a honey recipe. Fantastic. Thanks for much for this info. I’ve been looking forward to baking with stevia but a lot of questions to get answered. This is great. So glad you were able to freeze your fruits for later canning Sue. Hope you like the Pomona pectin! Yes. This is the ONLY time that it is okay to substitute stevia for the sugar. The reason you can do it here is because the low-sugar pectin has the added ingredient of calcium. The combination of calcium, pectin and acid is what makes it gel (or firm up). 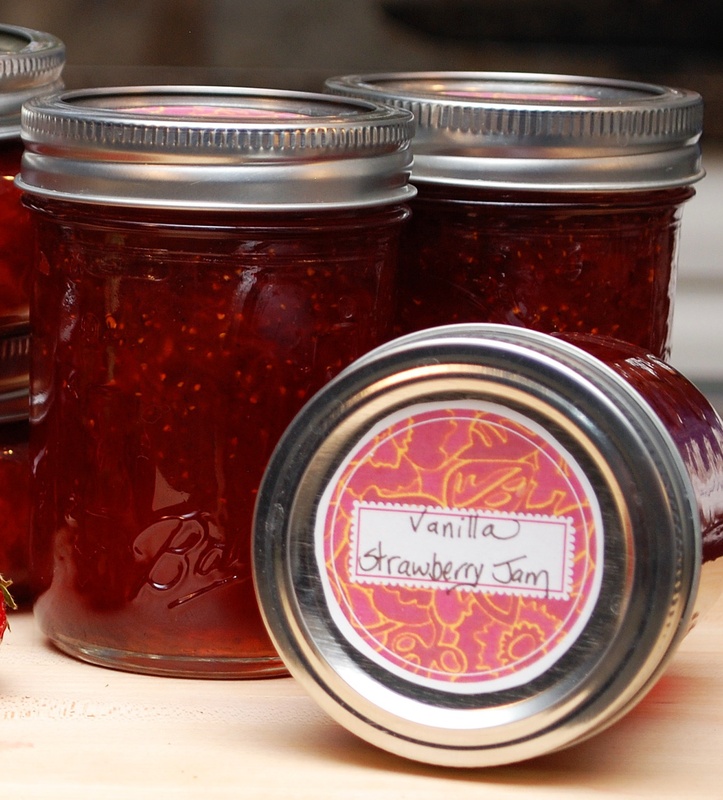 Any “normal” jam recipe uses a sugar/pectin/acid combination to create the gel. But with the addition of calcium, you are allowed to make this jam with low-sugar OR NO SUGAR and it will still work. The stevia can be used as the sweetener with no problems. You can also use honey instead of sugar. Could I substitute stevia for the sugar?